Those in a heat network can make even more by providing their surplus heat to others. In total, homeowners can be paid up to 8.5p/kWhr for the heat they generate and use. Reducing the need for costly fuel. Earning a stipend from the Renewable Heat Incentive. For many UK residents, the thought of earning money back through the RHI just for heating their homes is enough to justify the cost of a biomass boiler. Lower utility bills and a substantial rebate can exceed the initial biomass boiler prices over time. The renewable heat incentive tariffs will last until 2031 for non-residential systems and 2033 for residential components. Biomass boilers are a somewhat new development in the UK market, but consumers are reporting 15+ years of operation without any significant problems. Combine the long life span with the lengthy tariffs and the potential for earning is quite significant. Lost in the financial benefits are of course the positive environmental factors of using biomass boilers. The wood and corn used as fuel for these systems are a sustainable resource. Also, the burning of biomass emits the same amount of carbon dioxide that was absorbed while the ‘fuel’ was growing into fruition, making it carbon-neutral. In comparison, coal is about 20% less costly but produces the most carbon emissions of any fuel type. Other fossil fuels will cost more while also creating much higher levels of pollution. In short there are alternatives, just not good ones. Something else to consider is the fact that although the renewable heat incentive refers to biomass boiler furnaces, the system can also be used to heat water and provide electricity. Using biomass in more applications lowers our dependence on fossil fuels while lessening the carbon footprint. Biomass materials can even be harvested locally providing a boost for community economies as well. To determine the length of repayment for implementing a new heating system, it’s important to evaluate the biomass cost. The Energy Savings Trust has calculated that on average it costs £10,000 to £14,000 to install the system in a four-bedroom detached house. Compare that to the renewable heat incentive paying £1,500 and £2,800 per year in rewards and the repayment period is roughly seven years for the equipment alone. Of course, there are more costs associated with furnace operation outside of just buying the biomass boiler. The main ongoing cost is going to be purchasing biomass fuel. An example of fuel pricing is £150 per tonne for wood pellets and £70 per tonne for wood chips. Annual usage can range from 10-15 tons on up depending on building size, climate, and other factors. It’s wise to spend more on quality pellets (produce more heat, create less ash) for both efficiency and to reduce risks of damage to the boiler. Regular maintenance is another cost associated with biomass boiler ownership. At least, every 12 months it is recommended to have the flue, motor, and thermostat inspected, cleaned, and maintained. Wood pellet boilers prices are kept lower with regular maintenance and high upkeep that prevents expensive repairs down the line. Professional service also ensures the system is burning optimally and efficiently. Which Biomass Boiler Are Eligible? Burn only biomass or if below 45kWth be MCS accredited. Be installed after 15 July 2009. Be located in England, Scotland, or Wales. Northern Ireland has alternative RHI. Must own the property where installed. Must receive Energy Performance Certificate. Must provide Green Deal Advice Report (GDAR). Domestic biomass boilers UK – owners that are eligible for the RHI can submit an application online. In some cases, a decision is rendered immediately while in others in may require more information to complete. The application needs to be submitted within one year of the commissioning of the boiler and once approved, payments are sent quarterly. 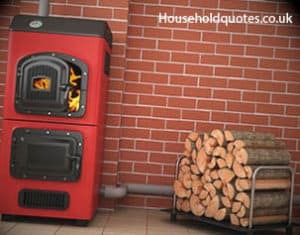 It’s imperative to remember that biomass boilers are a quality entity, and the renewable heat incentive is only a minor reason for implementing the system in your home. Even if you were never to receive any payment from the RHI, boilers help you save money by cutting down on annual fuel costs per year. Water heaters, furnaces, and other components that run on burning biomass are much healthier for the environment and are one of the major steps in making your property self-sustainable.